One important consideration when buying any keyboard-based musical instrument is the weight of the keys. The ‘weight’ of a key refers to the amount of pressure it takes to depress it. The key weight generally ranges from very soft/light organ and synth style keys, through semi-weighted keys, up to piano-style fully-weighted keys. Many people primarily look at what sounds, rhythms and other on-board features are available, but it’s a mistake to focus on these characteristics alone. On-board features can often be upgraded or expanded with new firmware, additional software or attached hardware, but the physical nature of the instrument can’t be changed. Read on for the most important considerations when selecting the weight of keys you should opt for. The types and styles of music you intend to play can have a significant influence on the weight of keys you choose. If you’re looking for an instrument which simulates the realism of a piano, fully weighted keys are the best choice. Alternatively, slightly heavier semi-weighted keys may be sufficient. Bear in mind all acoustic and digital pianos vary significantly in key weight. For those wishing to play more authentic organ music (be that church/pipe organ, rock organ, Hammond, or the like) a lighter organ-style key weight is the best choice. The lighter feel to the keys make it easier to play faster passages with less finger strain. Many original standalone electric pianos feature the lightweight organ-style keys. Semi-weighted keys can be a good alternative. Many synthesisers feature organ style light weight keys although some models do feature semi-weighted and even fully-weighted keys. Of course there’s no real-world acoustic equivalent for synth instruments, although anyone seeking the authenticity of vintage synths will almost certainly want the lightweight organ-style keys. 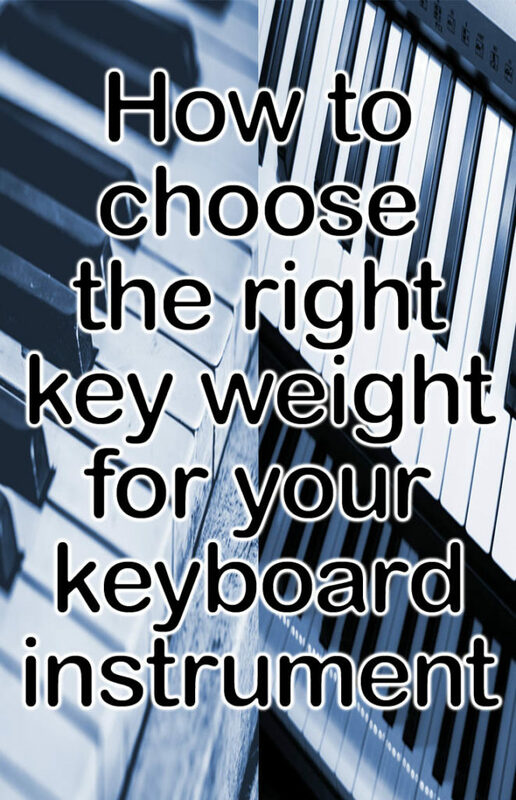 All rounder musicians face a bit of a dilemma when it comes to choosing the ideal key weight. If you’re looking to be able to play convincing acoustic pianos, electric pianos, organs and do synth work, it may feel like you have to compromise one instrument type over another. 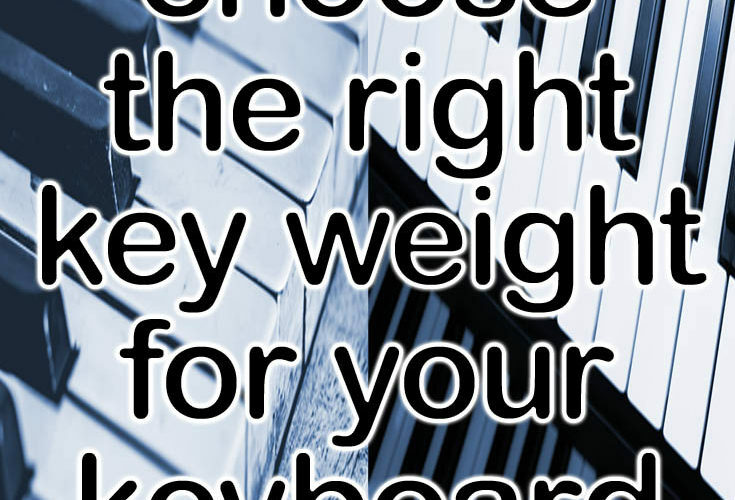 Unless you buy two keyboards, the best key weight to choose is likely semi-weighted. This will give you enough ‘bite’ for acoustic pianos while still being light enough to play some convincing organ and electric pianos, plus synth leads. Your own personal dexterity (and desired hand strength) will also play a part in determining what weight of keys you choose. I’ve covered some of the basics of improving strength and dexterity and different key weights can certainly play a part in this. Fully-weighted piano keys tend to develop stronger fingers and assist in mastering a wide dynamic range of playing, from very soft to loud. Unweighted organ/synth keys tend to allow faster passages to be played more easily – essential for some organ and synth solos. Semi-weighted keys offer some of the advantage of both types of key and so are a happy middle-ground. They can build finger strength to some degree while still allowing speed and dexterity. It’s worth bearing in mind that many keyboards have options which change the sensitivity of the keyboard. Some controller keyboards allow you to set a ‘velocity curve’ for the keyboard, which is much the same idea. These settings don’t change how the keyboard feels, but (in basic terms) they affect how much force is required to play notes across the dynamic volume range from soft to loud. Note that different sounds on the same keyboard instrument may respond to varying amounts of key pressure. Key weight tends to contribute to the overall weight of a keyboard. Of course, other facts such as number of keys, whether there are built-in speakers, and other factors such as internal components also play a factor, but key weight is definitely one to consider. In reality, fully weighted keyboards are going to be much heavier than their semi-weighted and unweighted counterparts – and not just because they tend to come as 88-note versions. Keys which are weighted using authentic piano action parts have the weight of the hammers and other mechanical parts to consider. If you are buying a keyboard to keep in your living room or home studio, then there’s not much to worry about after the initial purchase, delivery and placement. However, if you’re regularly gigging or moving the keyboard around for other reasons, its weight could soon become a real problem for you. In that case, lighter options afforded by semi-weighted and unweighted keyboards are definitely worth considering. Bear in mind that the choice of key weight extends beyond these three main categories. Every keyboard, even from the same manufacturer, has a different feel to it. Even different batches of the same model may end up having a slightly different feel, depending on how they’ve been manufactured. There’s no real way of knowing how any keyboard will perform without trying it out, and it’s one of the main downsides to buying a keyboard online. You really need to sit or stand behind the music keyboard or digital piano you’re considering purchasing and giving it a really good test drive. Play the types of music and instruments you most want the keyboard for, and see how it feels. It’s fair to say that a keyboard can grow on you as you get used to it over weeks, months and even years, but you can certainly tell an instrument that doesn’t feel right fairly quickly. Even if it has the best sounds in the world, if it doesn’t play right for you, it’s not going to inspire you and bring you joy. Spend time looking beyond the basic specifications of a keyboard instrument and get to know how it plays. You’ll be happiest when you find one which matches your own playing style.